FILE - Edwin Feulner, who then was president of the Heritage Foundation, is pictured in Alexandria, Va., Feb. 17, 2010. Feulner thinks there are "a lot of opportunities" for U.S. trade with Taiwan. 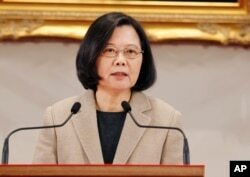 FILE - Taiwanese President Tsai Ing-wen delivers a speech in Taipei, Jan. 1, 2019.